Something concerning Pinterest was pressing on my mind lately. I felt there needed to be a more proper credit given to the artists and photographers whose work is shared on Pinterest. Though it is a great tool to share our work and get inspired by each other, it is also a tool people willingly or unwillingly misuse. When I read this article about copyrights, I thought it was time for me to go through all my pinterest boards, to see where I had forgotten to give proper credit. Turned out that I had a whole lot of work to do! Besides the points mentioned above, which most of us do unwillingly or without thinking, I noticed there are also a lot of copyright violations on Pinterest. These could be made unknowingly, of course. But some are not. And there are also a lot of spam links you should be aware of. 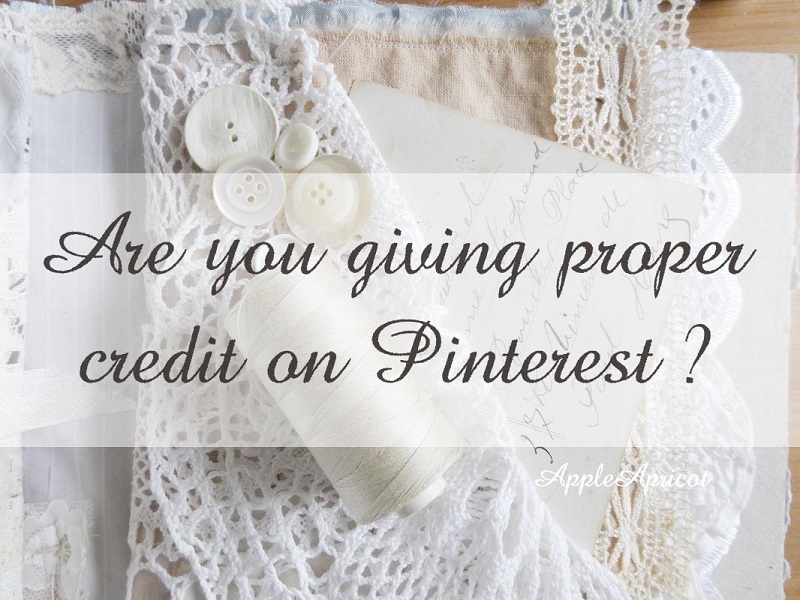 Please do know and be aware that Pinterest and pinners deal with a lot of copyright complaints and fights. I'm not going into detail here about copyright, because I'm not a lawyer and don't have any right to tell you whether or not you violate some else's copyright. You can find information on that if you search on the internet. But what I do know is that a lot of us are pinning without giving a thought about copyright. Me included, until now. What I do know, is that as a creative person we do care whether or not our work is given proper credit. So it should be with the work of other people too. We should be careful with each other's property, whether it be offline or online. 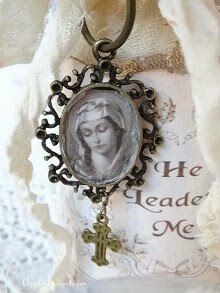 What really upsets me, is when I notice a pin that links to a tumblr blog of someone who's not the rightful owner of the photo, without giving any credit or any link back to the person whose blog they took it from. I think this is downright stealing! An example: I noticed a pin on my board Hearts Arts and Crafts of a gorgeous shabby hearts garland. The link turned out to go to a tumblr blog. This was reblogged I don't know how many times. After a search on pinterest I noticed this photo was pinned and repinned thousands of times from different sources. Luckily I found the rightful owner: my sweet blog friend Nancy of Sugar Lump Studios. I deleted the pin from my board immediately and repinned from the correct link, which you can see HERE. Imagine... your work being pinned and repinned thousands of times without any proper credit to you, the one person who took the photo and/or made the creation!! I wish I had been more careful before. May be some artists are not so much concerned whether or not their work is given proper credit or linked back. But I think most of us do. And not everyone likes to have their work pinned! Keep this in mind please. If you're not sure, ask! Most of the times people are very happy and grateful you ask. - If you'd like to repin a photo you see on Pinterest, please check the link of that photo first. Always. Does it link to the website or blog of the rightful owner? If it doesn't, and you can't find the original source, don't pin it. Or may be pin it to a secret board, if you really wish to save it on Pinterest for your own inspiration. - Like I said above: pin from the original source, not from a copy or feature. 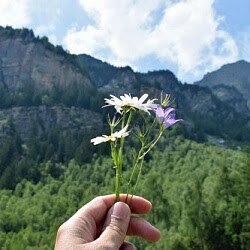 Features on another blog may be authorized by the makers of the art or photos, but still it's common courtesy to link back to their own blogs. - Before you pin or repin a photo, make sure you know whether or not someone likes to get their work pinned or not. Some people really don't want their work to be pinned and you don't want to risk a legal fight, do you? If you're not sure, ask! Send a personal message or leave a comment on their blog with your inquiry. - Try to give credit in the description box below the pinned photo as much as possible. Mention the author/artist/photographer. - Try to pin from the original blog post or web page, in stead of from the home page of a blog or site. You'll be thankful later, when you try to find back that delicious recipe, gorgeous art work, or handy tutorial. How to make sure your own work gets proper credit or a proper link back? Alas, we cannot have control over other people's pinning habits. But we can make it easier for others to find us back in case someone featured, copied, borrowed, stole our photo. How? - Watermark your photos. Put your name or the name of your website, blog or online shop somewhere on the photo. Best to do so somewhere on the photo where it will be hard for people to erase your name. - Help people find your original blog post back by following this tutorial by Marie of Code It Pretty HERE. - Ask pinners to add the correct link if it's not there. Most people are happy to do so. And you can let people know you're happy to let your work being pinned, by adding a text or blog button to the sidebar of your blog with something like "Pinning Allowed". I'm going through all my Pinterest boards at the moment to check the links and descriptions. I'm deleting all spam links and illegal copies. And I'll try to find back as many original sources as possible. I think this is just the only right thing to do. For the time being I have put all of my boards to "secret", so you'll not be able to see them public again before they're considered "clean". That is my choice to do so, because it helps me to get this done asap. Because I want my boards to be public again asap of course! Pinning should be fun. For everyone concerned. Please do your best to give proper credits and link backs. Ps: if you're using photos from Pinterest on your blog, then think twice adn be sure to read the story of Roni HERE. She got sued. It could be you too. You don't want that, do you? Well done Wen!! I need to do this with my pins too because I'm quite sure that proper credit hasn't been given on some (if not a lot!) of them. I suppose another way to get around it would be to simply make all my boards secret and then at least I wouldn't be perpetuating the issue. I think one of the most blatant copyright infringements I see is the abundance of 'free' links to Tilda dolls and many of them are to the patterns themselves. I have pinned some of them for inspiration only but I would never consider downloading those supposedly 'free' patterns. I suspect the author of 'Tilda' (and others like her) are fighting a losing battle now that pinning has become so viral. Oh yes, I so agree with you! I see them on Pinterest too. And on blogs. I must admit that I wasn't as careful at first and most certainly have made my own copyright mistakes in the past. But now that Pinterest is so immense popular, I feel we have the duty to be more careful. Thank you for your comment! Much thanks to you Wen. I think you were describing me above, -someone who sincerely had not given this much thought; but I am now! Being (ignorant) unskilled in the tech world does not give me permission to 'unknowingly' cause (at the least) discouragement or hurt feelings, or (at the most) even infringement or break the law! Hmm, definitely something to look in to. I must say if I see something I want to remember I just pin it without much further thought! Me too, Laura, I did that too! But I really try to change my pinterest attitude now. Thank you VERY much for this article Wen. I don't pin people's work for this reason.I have never given permission for my work to be pinned, yet I find it all over the internet. It's a form of stealing really isn't it. There is nothing on my blog to say that people are allowed to pin my photos, yet they are all over Pinterest. Its not a big deal for me personally, but I recall many blogger friends who had massive problems with their tutorials for example being presented as the pinners own. Oh dear, I am guilty! Thanks for this very informative blogpost, Wen. I will have to make all mine secret too, as I have so much tidying up to do. I do think Pinterest should explain it better when you start, though. 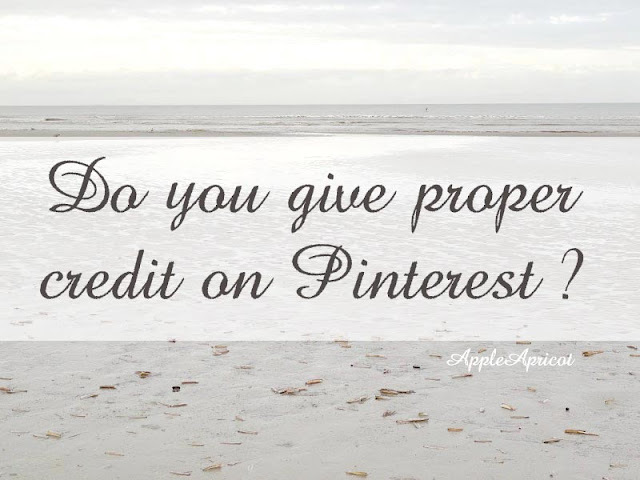 Another thing you can do to help your own property get pinned properly is to fill in the Picture Properties - Title Text and Alt Text for each of your pictures when you compose your post. When someone pins the picture, this default text appears. Thanks, Wen, even though I am squirming uncomfortably...It's a pity, but this could really change the structure of Pinterest if everyone makes their boards secret. I have been trying to make sure that all links are working and go directly back to people's blogs ever since I realized that isn't always the case. Although I have not asked for permission to pin something if the little pin shows up when hovering over their photo, I just assumed that it is ok if they allow that to be there, I would totally forget who I asked permission from if I had to ask for every pin I do. I do need to go through all my boards though and make sure they are all in working order since I didn't realize that fact until I had the boards for quite some time. Wendy your book is Amazingly gorgeous!! I love love it.